 A collection of doctor-bashing stories and gripes about medical care compiled by a father-son team in the health care industry. The senior Jacobsen (Hostage, 1991) spent 30 years as a hospital administrator and the son a decade in health-related fields. They interviewed over 100 health care ``insiders''-- doctors, nurses, technicians, pharmacists, equipment salesmen, insurance providers, lawyers, hospital administrators and employees, and others--to find out what they consider to be the biggest problems in the industry. 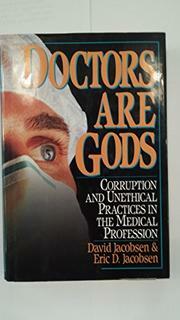 After an initial chapter on the evolution of doctor-patient relationships by an unnamed ``expert on medical sociology,'' the interviewees' comments are grouped into chapters on such themes as the arrogance of doctors, the greed of doctors, and the failure of the medical profession to police itself. Other chapters focus on laboratory fraud, quality- of-care problems, the financial woes of hospitals and small pharmacies, malpractice, and the shortcomings of HMOs. Each chapter opens with a minimal introduction by the authors and then offers two or three dozen brief and sometimes not-so-brief comments by the interviewees, which frequently smack of ax grinding. The interviewees' names and qualifications are not given, but their occupations can often be inferred from the context; e.g., pharmacists complain about the cost squeeze that's hurting small pharmacies. At the close, the authors sketch some simplistic solutions, such as, greater federal control, tort reform, and increased awareness by patients of their rights and responsibilities, and they include some cursory advice on how to select a doctor. Compared with the solid research and in-depth analysis found in Marc Rodwin's Medicine, Money and Morals (1993), Harvey Wachsman's Lethal Medicine (1993), and Neil Rolde's Your Money or Your Health (1992), this is superficial stuff, full of horror stories and unsubstantiated claims. One long kvetch that health care reformers can safely ignore.